Recently, I've really gotten into scented candles. I've always loved the soft glow of candlelight, but it's only in the last year or so that I started switching my unscented candles for their scented counterparts. There's just something about the gentle scent of a candle wafting through the house to round off the effect. I always find it fascinating how strongly scents and aromas can evoke feelings, or bring back memories. Of course, I have a strong fondness for food, so it should come as no surprise that my favourite scents include vanilla, cocoa and cinnamon! 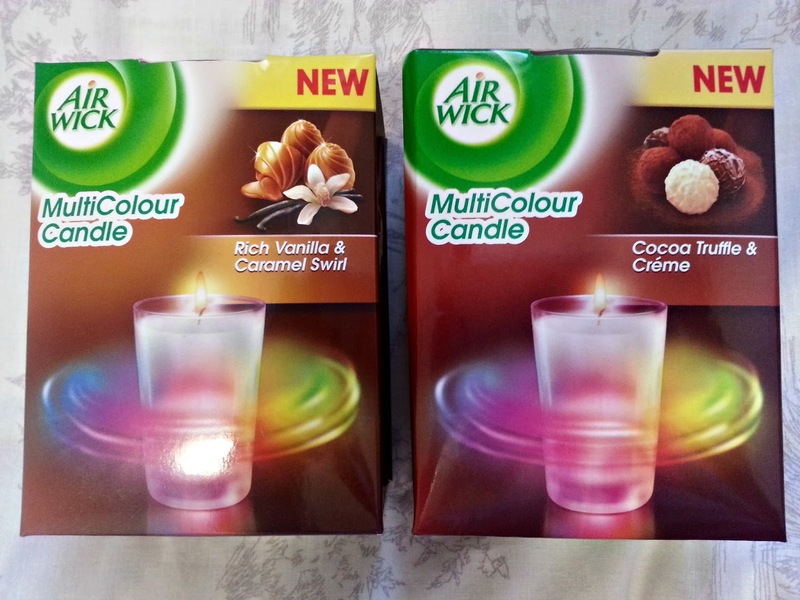 Now, while I have been aware of (and used) Airwick products for years and years, I only recently was made aware of their range of scented candles, available in some nice fragrances. I was particularly drawn to the MultiColour Candles. The original candles are in a frosted white glass, in three scents (Rich Vanilla & Caramel Swirl; Cocoa Truffle & Créme; Precious Silk & Oriental Orchids). How cool is that?! I love how these candles will look pretty and elegant sitting around your house, and then change into a pretty light show when lit, all while gently giving off their delicate scent. This brings me to this week's Blog Birthday Giveaway! I will be giving the above two candles (One "Rich Vanilla & Caramel Swirl", one "Cocoa Truffle & Créme") away to two readers. This giveaway is open to South African residents. To enter, please use the widget below. The only compulsory entry is to leave a comment on the post. Make sure that you leave your email in the comment so that I can contact you if you win! You can earn extra entries as stated (please note, you can earn an extra entry every day by tweeting about the giveaway, but these entries only register if you inform the widget that you have tweeted). The winner will be announced on Friday the 14th of February 2013. Good luck! Oh Happy Birthday to your blog!!! I've always wondered if this actually worked! I'm blown away now! I need one! LOL! Happy birthday to your blog! I've often eyed these candles, but never bought one. Happy Blog Birthday! These candles are awesome. I've been dying to try one. Happy Happy! love these candles. Happy Blogversary! Dead cool giveaway. I am also a Feb baby, so Happy Birthday!